Most Winnipeg folks my age remember the CJOB Shut Ins Program, which aired Sunday morning for many, many years. Most of all, we recall its genial gentleman host, George McCloy. I often did the weekend morning shows on CJOB Winnipeg during the 1970’s. The Saturday morning show was busy and upbeat – similar to the weekday mornings. Except I did not do “Beefs and Bouquets”; that was Red’s domain. But Sunday mornings were more laid back. My on air stint ran from 7:00 a.m. to 12:30 p.m. Finally, during the last 90 minutes, I just played a tape and spun some discs. 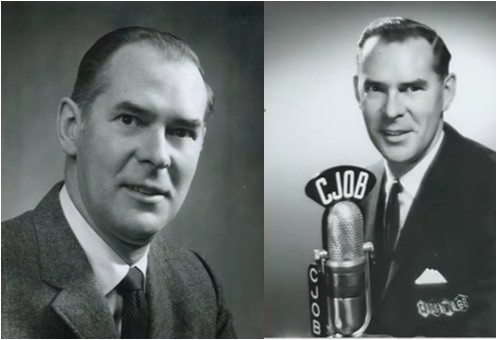 George McCloy and the long running CJOB Shut Ins Program were featured on that recording. This show contained slower-paced vintage music and best wishes for Winnipeg’s most senior of senior citizens. During the week, listeners wrote or phoned George with short remarks of good health and musical dedications to older relatives and friends who were “shut in.” He arranged these messages and musical dedications. George always introduced each song with the phrase “just for you”. That was my cue to start the record. Few radio announcers spend their entire career at one station. Most noteworthy, George McCloy did. He was on the air at CJOB from 1946 to 1987. “Hank” was one of the Royal Canadian Air Force veterans that joined J. O. Blick to start the station one year after World War II. As you can see in the two pictures above, this gentle man held up well over time. Early in his career, George played a big role in the CJOB broadcasts of the Winnipeg Blue Bombers. Since most of my on-air work at CJOB was evenings and weekends, I did not really know him very well, other than our professional relationship. George’s main program was the lunch hour shift on weekdays, including his “Ladies Choice”. I do remember though that he loved golf and spending weekends at the cottage. He passed away in 2007. Elderly women over the age of 80 were the main demographic for this show. A lot of our younger listeners found the music and content depressing. To be honest, even I referred to the show as “Gentle Sounds for the Geritol Generation”. (Only off the air,of course. Bad boy.) But the CJOB Shut Ins Program served a worthy purpose. Radio stations tended to ignore this demographic completely, so we at least did something for them. Another benefit of running Shut Ins was that we were able to avoid carrying a church service during this time period, something most radio stations did in the early years but discontinued. So, exactly why is it called Amateur Radio? Thanks for this reminiscence. My grandmother listened to this show every week. I remember thinking at the time that if I were a “shut in” the show would likely prompt me to string myself up in a closet. However, it also exposed me to the music of Debussy and other great composers. In the end it was a real gift. When I tell people about this show they think it’s hilarious. Thanks for the comment, John. I agree on all counts! Could you tell me the title of the song that was played at the beginning of “The Shut-ins Program”. Great question, Ron. But sorry, I can’t remember. George always recorded the music onto his voice track so I never saw it. Cheers, John.